There is a world of ghosts, legendary creatures, and paranormal events out there just waiting to be discovered....or is there? That is what Josh Gates and his intrepid crew hope to find out in the ScyFy Channel's original series Destination Truth. Using the most technologically advanced equipment on the market, Josh and his crew head to every corner of the world to try and capture evidence that will either prove or debunk the existence of those otherworldly beasts. They do so by examining the history of the legends, talking to the locals, and conducting painstaking investigations of the area in question. 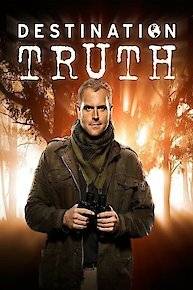 Destination Truth differs from many other shows of this ilk by adding a few elements that really add to the adventure of the investigations. Much of the excitement comes from them actually trying to reach the remote locations as they often have to cross raging rivers, rickety bridges, and fly in rather suspect looking airplanes. The investigations are always serious, but charismatic show host Josh Gates always manages to throw in a little splash of humor, often at his own expense. The hour long show usually features a pair of investigations, with each segment ending with the team taking the evidence to animal and paranormal experts for further scrutiny. What they don't do is simply pass off the evidence as something that it's not, opting instead to always reach for the truth, even if that leads to a rather deflating conclusion. Shows about the paranormal are all over the TV airspace at the moment, but none of them take the approach to the subject in the way that the Destination Truth team does. You really don't have to be a fan of the paranormal to get a kick out of this show, and can instead just sit back and enjoy the adventure that Mr. Gates and his team lay out before you. Josh and the team cross the dangerous wilderness in the Philippines, searching for paranormal activity in hanging coffins. What they discover is one of the most shocking paranormal discoveries in DT history. Then, the search of Central Asia's Bigfoot brings the team to Kazakhstan. The team prepares for their journey through the back woods of Transylvania in search of a real-life vampire monster. The team heads to the Mayan city of Tikal to investigate claims of paranormal activity. Also: A sea creature is sought in Fiji. The team heads to Kazakhstan to investigate claims of a crashed alien spacecraft and a potential government cover-up. The team heads to Fiji to investigate claims of ghosts of the victims of a former cannibal tribe; the team visits the Philippines to locate a dangerous water monster. The team investigates claims in Romania and Belize. The fifth season premiere kicks off with Josh and Team truth investigating claims of a Bigfoot-like creature in Vietnam. Josh and Team Truth sail to Antarctica to investigate stories of ghosts in the buildings left by former explorers of the continent who never returned home alive. Josh and the crew go to Cyprus to examine a huge sea creature. Josh his team are in Namibia investigating sightings of a strange creature that has driven people from there homes. Then they're off to Thailand, where giant ghosts are hiding in the jungles. Josh and his team head to Panama to investigate claims of a new cryptid, and then to Namibia to investigate rumors of a haunted mining town. Team Truth investigates a vicious pygmy primate in Argentina, as well as a haunted former prison. Josh investigates Duckett's Grove Castle in Carlow, Ireland with special guest investigators, Kris Williams and Barry Fitzgerald of Ghost Hunters International and Jael de Pardo of Fact or Faked: Paranormal Files. Josh and his team head to Madagascar in search of the Fangalobolo beast. Then they go to Guam in hopes of finding the Taotaomo'na zombie-like spirits. Josh and his team travel to Kenya to attempt to find evidence of restless spirits said to be haunting the battlefield where they were slain. Then they fly to Madagascar, where a small, humanoid creature is terrorizing the islands' inhabitants. Josh heads to Nairobi Kenya to investigate a haunted volcano. Team Truth travels the globe to find the Siberian Snowman - better known as "Bigfoot." Team Truth treks to Micronesia to conduct the world's first underwater paranormal investigation. Josh is on a quest of truth to determine the reality of a unknown predator. Angkor Wat is an 800-year-old temple in Cambodia that is a landmark and tourist attraction. However, it believed to house some of the world's angriest spirits. In Canada, a man disappeared while fishing in the Okanagan Lake with no explanation. This is just one of the many disappearances that has occurred in this water. The local rumor is that an angry monster is the culprit. In the Fourth Season Premiere, Josh and his team travel to Italy, where they investigate claims of ghosts in Pompeii, a Roman city which was engulfed by a volcanic eruption of Mt. Vesuvius in the first century AD. Then they go to Kenya, where a creature called the Nandi bear is said to make its home. Destination Truth is currently available to watch and stream on Syfy. You can also buy, rent Destination Truth on demand at Amazon, Vudu, FandangoNow, Google Play, iTunes online.